Ireland needs more blood platelet donors. Platelets are a component of blood, essential to stop bruising and bleeding. 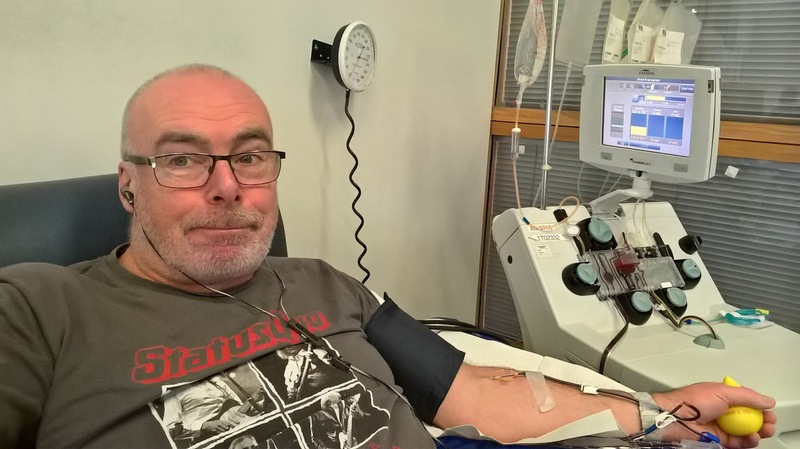 Over 22,000 platelet transfusions are needed every year in Ireland - I donate about 10 times a year at the Irish Blood Transfusion Service Clinic in St James's Hospital. Especially at holiday time, donations are needed more than ever. Unlike whole blood, platelets only last a few days - so a steady supply is needed. Today I did my 125th donation. You can see a Blood Platelet Apheresis Machine to my left in the photo below. Basically it extracts whole blood, and removes the platelets with a centrifuge, and returns what's left. It's completely painless (OK - the needle at the beginning can sting for a second) and takes about 50-70 minutes, though this varies from donor to donor. My donation took 74 minutes today. I started to watch "Designated Survivor" on Netflix throughout the donation. If you are interested in becoming a blood platelet donor, check out the Give Platelets page at the Irish Blood Transfusion Service's web site. You'll be glad you did it!